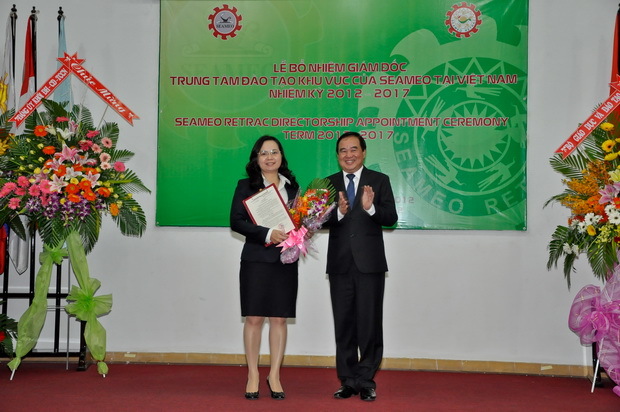 July 27, 2012, the SEAMEO RETRAC’s Directorship Appointment Ceremony which officially announced Dr. Ho Thanh My Phuong to be the Center Director for the term 2012-2017 was conducted. Attending the ceremony were Assoc. 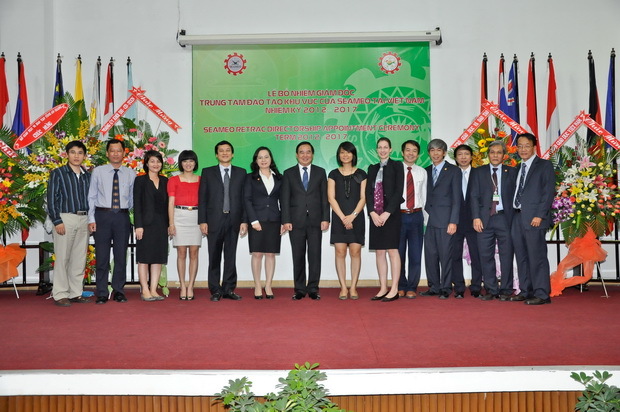 Prof. Dr. Tran Quang Quy, Vice Minister of Education and Training of Vietnam, the leadership of different departments, representatives of diplomatic corps, organizations, agencies, universities and colleges, high schools, teaching faculty, and all SEAMEO RETRAC staff members. Vice Minister Tran Quang Quy highly appreciated efforts and contribution by Dr. Ho Thanh My Phuong together with accomplishments the Center has achieved during the past few years. Along this line, Vice Minister Tran Quang Quy directed the newly-appointed Director and the entire Center’s staff to effectively perform its assigned tasks and enhance its reputation as a leading training center in the region in the field of educational leadership and management, research, language training, cultural and intellectual exchange.Strengthening political and ideological pedagogy, enhancing political awareness for the Center’s staff and teaching faculty; promoting and implementing the Directive 13 of the Political Bureau on “Studying and Pursuing the Moral Example of Ho Chi Minh” and putting it into practical operations of the Center; continuing democratic expansion well-aligned with disciplines and consolidating the unity of the leadership in utilizing resources to turn the Center to a well-rounded organization which promotes solidarity and international integration. 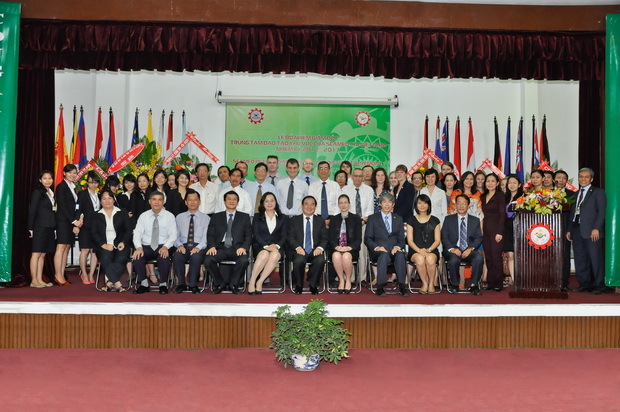 Being the leading center in educational research and development, promoting research and comparative study of various educational systems to be applied back in Vietnam’s context; developing a high-tech center to introduce standard models of educational evaluations and assessment, teaching methods, and ICT application to develop training programs; striving to become a regional information center in the field of education and management, and an independent accrediting body. Continuing to enhance joint training programs with educational organizations, universities and colleges in the world to develop high-quality training programs in the field of education and management; expanding linkages with institutions and international organizations in the world to develop and provide overseas study consultancy services to customers. Standardizing the evaluation of teaching and learning performances of foreign languages, especially English; providing consultancy to The National Foreign Language Project 2020; developing and intensifying English training programs; especially fostering language proficiency of teachers of English. 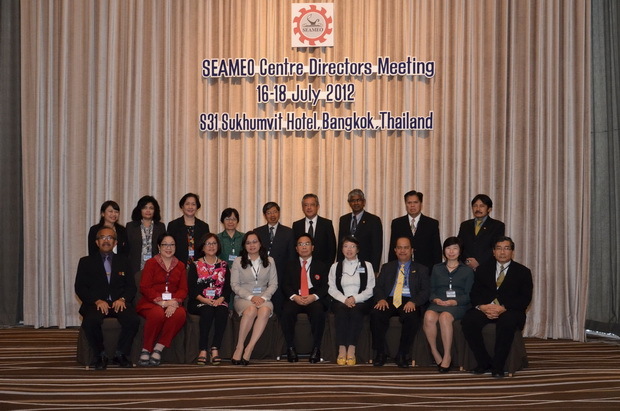 Striving to establish a Foreign Language Testing Center under invigilation of Vietnam’s Ministry of Education and Training (MOET); expanding inter-relationships with units and/or agencies under MOET’s network, especially the newly-established SEAMEO Center for Life-long Learning (SEAMEO CELLL).